Public engagement is not the same thing as education, but since my own involvement has often been on the interface of these two areas, they got to share a page. I’ve made several YouTube demos of scientific experiments, some of which have several thousand views. See the videos page for more. 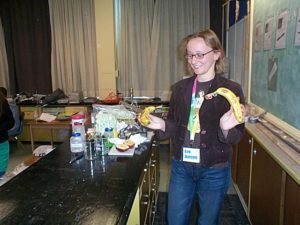 As a graduate student in Canada, I was involved as a volunteer for the local chapter of Let’s Talk Science, as well as for SickKids’ Kids Science initiative. For both roles I visited schools and community centres to talk to students aged 5-18 about science and to do hands-on experiments with them. I’m a member of the Public Engagement Forum at the Institute of Cancer Research, and have been involved in VOICES. For these groups I’ve joined meetings to discuss best practices in science communication, and share ideas with other practitioners. If you would like me to offer advice on science engagement activities or help you find the right people for your activities, please get in touch to discuss rates.